Nozomi, crosser of Space and Time, walks onto the field! Genpaku Arishima, the Flash of White, appears! 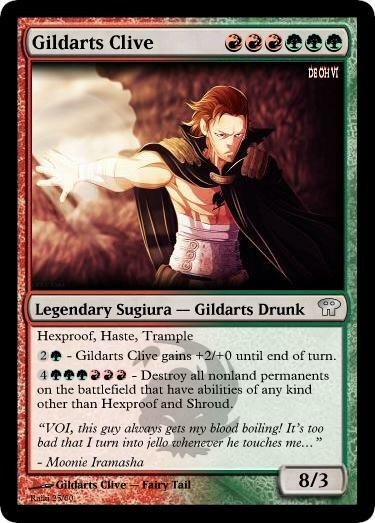 Gildarts Clive, the Smasher of Power, arrives! Reimu Iramasha, Guardian of the Shrine, approaches! Kaguyami Iramasha, Spatial Councillor, descends! 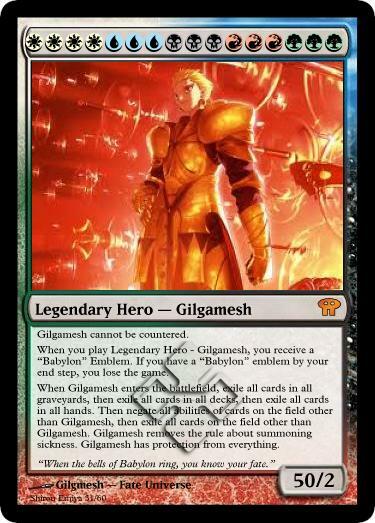 Gilgamesh, King of Heroes, finishes! Seventh set of six cards has been completed! Thanks to owners of all the characters. I claim no credit for any images or intellectual property used. Created using Magic Set Editor ~ Sourceforge.net. Special Note: Nozomi is indeed a planeswalker, literally in canon, considering how the reason she exists on PH is because she traveled through dimensional space to arrive here. Putting this here to remind myself to make a version. 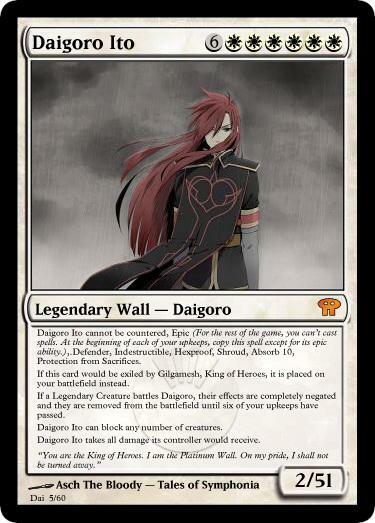 Daigoro Ito, The Platinum Wall, stands tall! 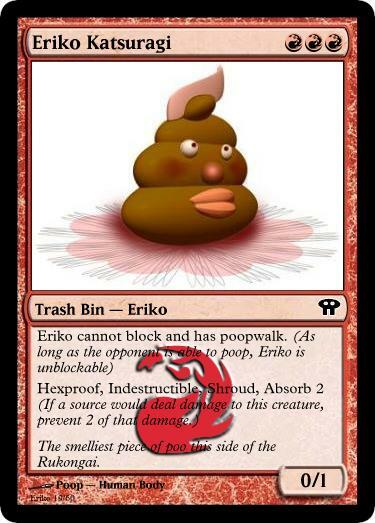 Eriko has a erm.. yeah. Hakai Chikara, the Iron Vizard, crashes in! Alucard Iramasha, the Vampire Extraordinare, descends! 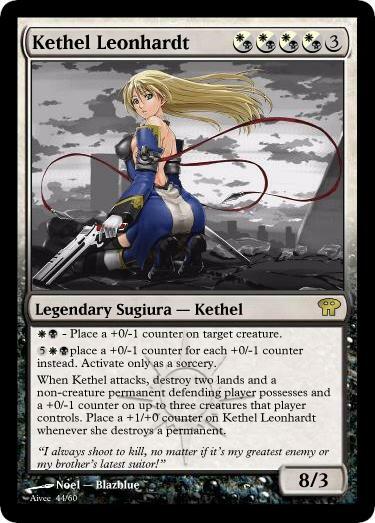 Kethel Leonhardt, the Spamming Goddess, has joined her brother! 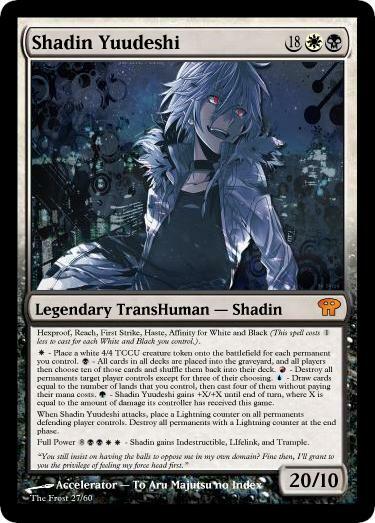 Shadin Yuudeshi, the Main Character, has bolted in! Eighth set of six cards has been completed! We're starting to reach the end of the core set! Thanks to owners of all the characters. I claim no credit for any images or intellectual property used. Created using Magic Set Editor ~ Sourceforge.net. Entering is Ketsu Iramasha, The Bane of Iramasha Island! Alice Iramasha, his Granddaughter, also arrives! 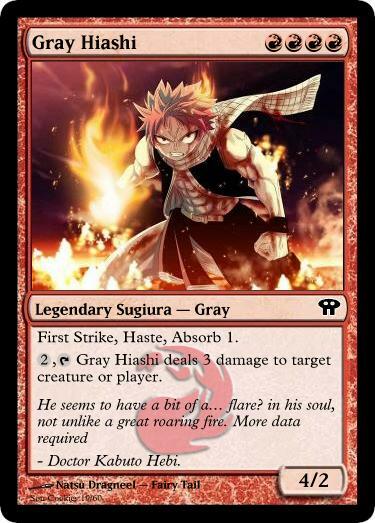 So after is Gry Hiashi, the Dragon of Flame, awake and alive! After that i SHisome Saihokku, the Doll of Existence, present! Sassy, the Beast of Legends, is awake and looking for a certain banana-hair! And last of all is The Truth, always there and ready to be listened to! Set nine is done! We're almost to the completion! I own none of these characters, naturally, and all images are belonging to their respective owners. Thanks to Magic Set Editor for letting me make these, which you can find at Sourceforge.net! 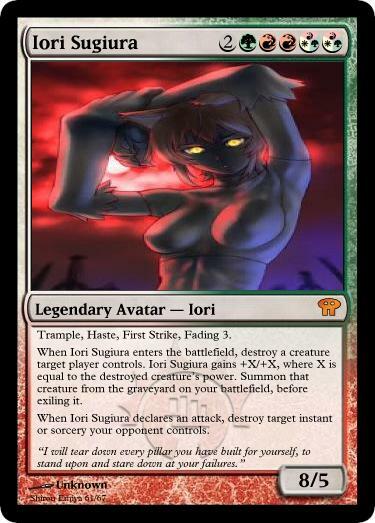 Iori Sugiura, the Goddess of Battle, has descended! 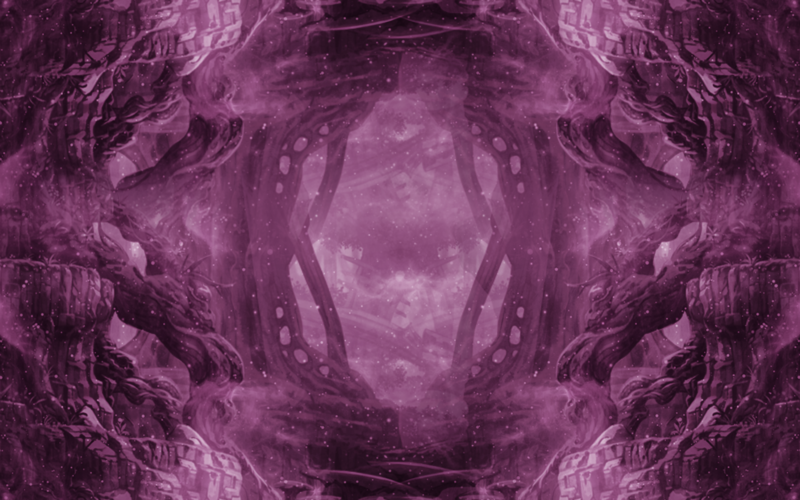 Kin Iramasha, the All-Seeing Vision, appears! MIsaiko Iramasha, the Wind Goddess, has just flown in! 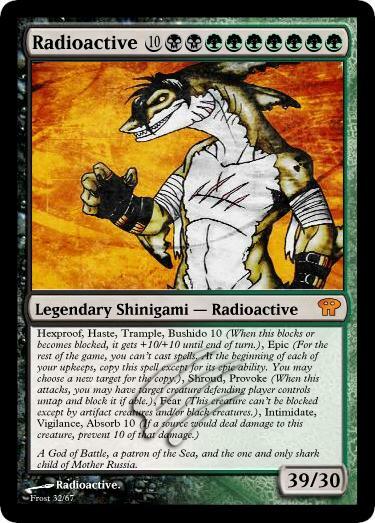 Radioactive, the Man of All War, has rampaged! Touketsu, the God of Demons, has arisen! Finally, Colin Washi, the Eagle God, has apeared, signifying that at long last, the set is complete and the Cast is present for this great set, the set of Platinum Hearts! The final set is DONE! 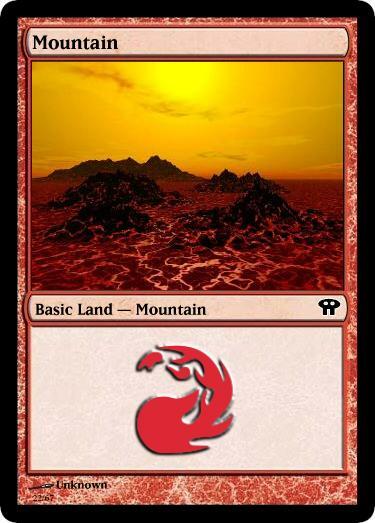 All sixty plus cards have been completed and printed, and now for extra fun I'm going to add in the lands that I've gotten made so far. Thanks to everyone and Magic Set Editor especially for making these possible! All credit goes where credit is due. Version 1.02 is now available!! Cero, Hohl Arquero: So this has been bothering me from the very beginning. If you do not intend for a card to be played normally, remove its casting cost entirely. Additionally, unless its creature type is used for something special, change it to something more streamlined such as "Spirit Archer". Tourouzan: This should cost zero mana as it had originally. The cost is okay because not only can it not target creatures (not removal), and a sorcery, but it also takes up a resource I like to call card advantage. Also should be a common. Yuudeshi Network Tower: I feel this is just underpowered. It's incredibly difficult to build a deck centralized around TCCU clones, so it could with costing one less. 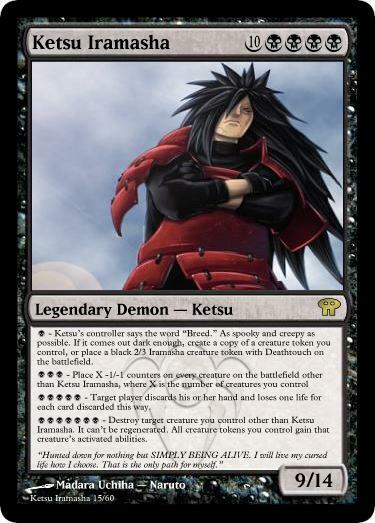 Nagato, Sage of the Six Paths*: There is just something fundamentally wrong with this card. I feel it needs a rework, something that will make it actually playable. Perhaps save this for next set. Xaser, Nine-Tailed Beast: God please remove the health costs from this card. The first ability can be nerfed to "Destroy target creature with toughness 3 or less." The ultimate, however, should not be like this. It costs an entire 9 loyalty counters, it's supposed to be epic. The summoned creature doesn't even have indestructible or hexproof. 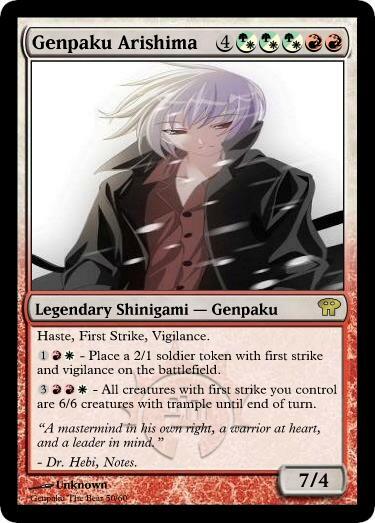 Lastly, that ability should say '...Put a 9/9 legendary black Beast Spirit creature token named "Ninetails" into play..."
Akisame's Feast: This should be common. 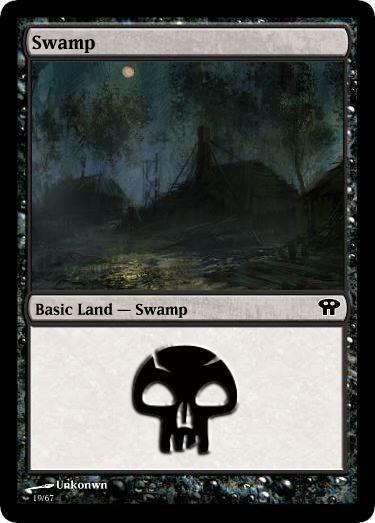 Also I think it should have one less swamp and one more colorless in its cost. Alucard Iramasha*: Undying's ability is skewed here to make it work for him, which isn't right. Just write out his ability, or rather I'll even do it for you. 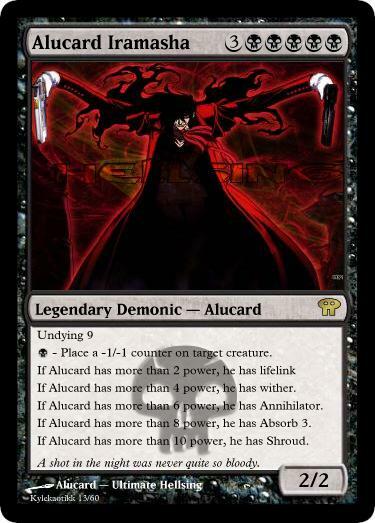 "When Alucard Iramasha dies, if he didn't have more than nine Undying counters on him, return him to the battlefield under his owner's control with an Undying counter on him. Alucard Iramasha gets +1/+1 for each Undying counter on him." That being said, Alucard is blatantly overpowered and just has too many capabilities. He needs to die less and stomp less. The -1/-1 counter ability alone is enough to justify his cost for god's sake. 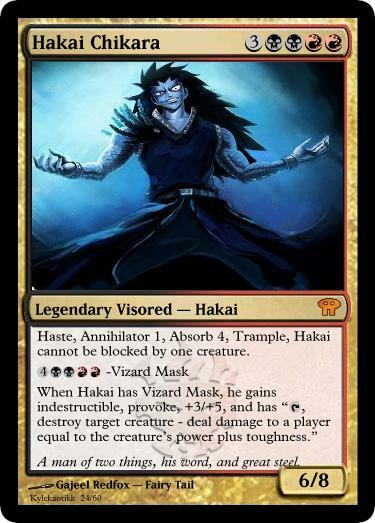 And no I don't care about his additional cost about sacrificing all creatures, as this can be abused. I would consider a rework by next patch. Caja Negacion: "When Caja Negacion is removed from the battlefield, remove all Negacion counters placed by this creature." Also, it needs a creature type "Wall". Cattle: "place two +1/+1 counters on target creature you control." You may cast this card from your graveyard at any time for 2BBB. If you do, put two age counters on that creature." Demonica Nightfang: Discard is a term used only when targeting hands. Otherwise it's just "Target player puts the top five cards of their deck into the graveyard". 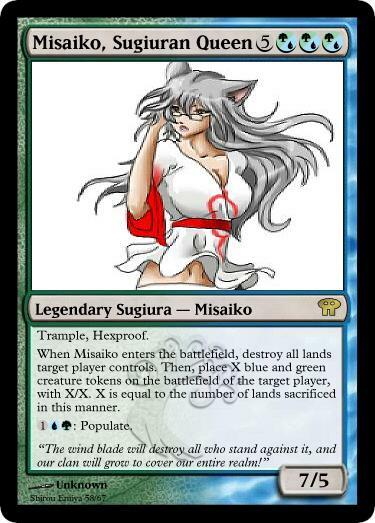 Other than that, this card feels underpowered and really difficult to fit into a deck. You might wanna rework this one. Devour Death: Common, not uncommon. 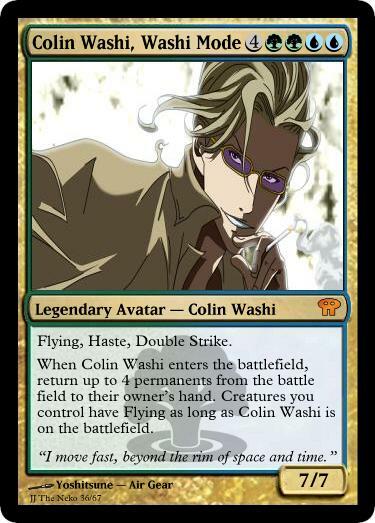 Doctor Kabuto Hebi*: ...If I make a cool planeswalker Hebi, can this card be removed? It suffers from you having made it before you knew how to Magic. It's just broken and hard to use. Fushimi Mamoru: This was super overnerfed. It was super overpowered before the nerf, but this is a result of you going crazy with the life costs again. 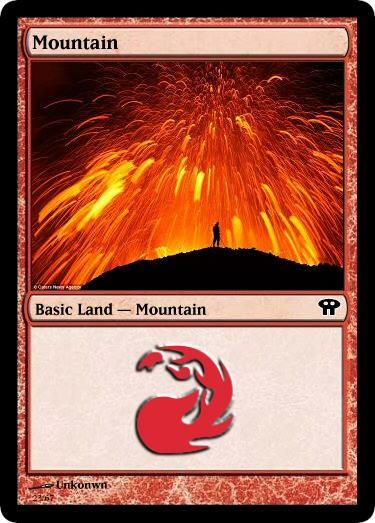 If it's going to be a mythic rare, it's gonna have to be worth it. I suggest getting rid of the haste, rid of the life cost, and it should be good. It's clear weakness is just how easily it can be removed. Hollow Consumption: This is common. Hollowification: This is uncommon, and also underpowered. It should give enchanted creature +3/+3. 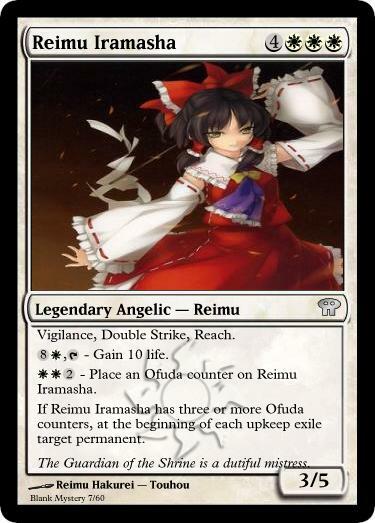 Ketsu Iramasha*: I suggest a rework that makes this card a little less epic and a little more playable... and a little less creepy. Mana Asthavon*: Name is spelled wrong, and yet again this is another card that suffers from too many abilities and difficulty of ever getting it out on the field. At this point I am willing to remake cards like this for you. I am in no means trying to take away what you created, but it would be so much more awesome if we could actually see these guys out on the battlefield and in play. Painful Gran Rey Cero: Dis is a rare. Persistent Hollow: If there's no flavor text here, you should just include the reminder text for Dredge. Resureccion: This should cost one less and it most certainly does not warrant a mythic rarity. Shadow Burst: Change from Sorcery to Instant. Swallow Their Soul: Now this is actually overpowered. It simply needs to cost more, like 3BB. Throat of the World: ...This doesn't really deserve a mythic rare either. Vizored Mask: Unnecessary life loss strikes again. 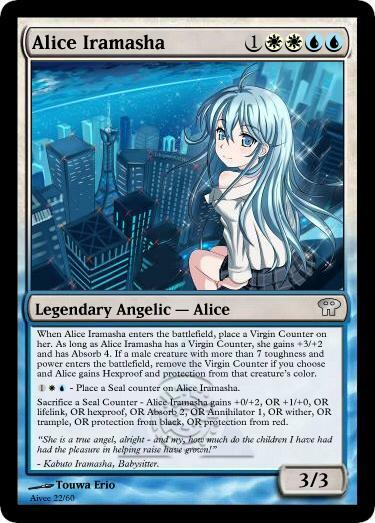 Rather, give it +6/+6, and also put a -1/-1 counter on the affected creature (Balances out to +5/+5 until end of turn, but has a -1/-1 counter after that turn). Xeno Hollow: No. Stahp. Not mythic rare, just rare. Overbearing Hollow: I think this should be uncommon actually. Stefan Soan*: Needs a rework. Just too difficult to use and hard to fit into a deck. Micheal, Demon Prince: Can there be less color and more colorless in this guy's mana cost? And speaking of costs, it should be 5 total instead of 6. Ashlei Clixx*: Needs a rework, though not as badly as the others. Hakai Chikara*: Same as above. Jin Hoshigawa*: Same as above. Relentless Hollow: This should be rare. It's on the verge of being overpowered. 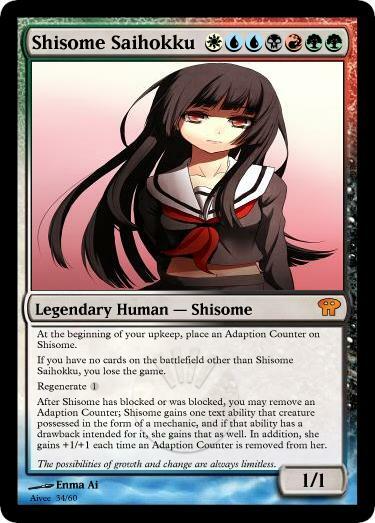 Shizou Heiwajima, Edotensei: This card feels underpowered. Additionally Edotensei Construct seems like a strange creature type. A Walk in the Woods: "Look at the top four cards of your library. 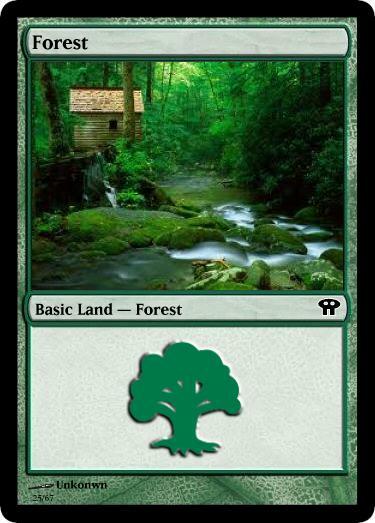 Place any Forest land cards from among them into your hand and put the rest on top of your deck in any order." Ancient Menos Grande: Change creature type to Spirit like the rest of the hollows. 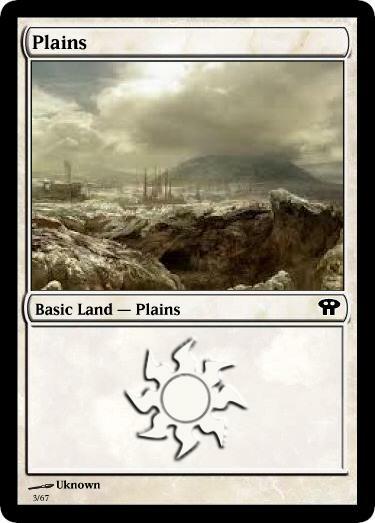 "As an additional cost to cast Awkward Discovery, sacrifice a land you control. 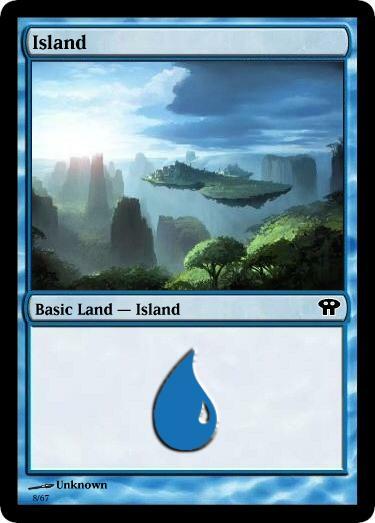 Search your library for up to three basic land cards and put them onto the battlefield tapped. Then shuffle your library." At the beginning of your upkeep, put two +1/+1 counters on enchanted creature and sacrifice brutal training." 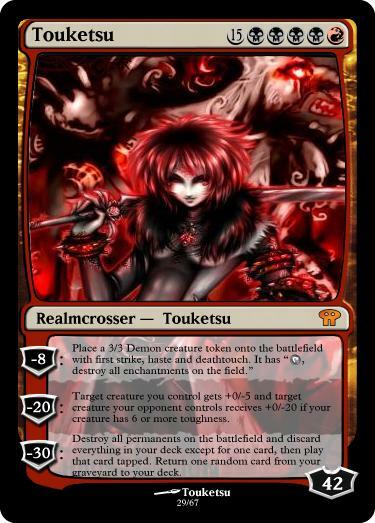 Burst of Reiatsu: This should actually give +4/+4 only. Calm of Battle: The way you have this worded can actually be replaced with "Prevent all damage that would be dealt this turn." Hidden Nature: The land should come into play tapped. Moonie Iramasha: This card is actually pretty okay, but that doesn't stop me from having a suggestion for him. For a green card, just him dealing damage to a creature doesn't feel right. It can be incorporated into his last ability where he battles an opposing creature. But it should feel more satisfying and less 'gamey'. As it is you can use that ability and attack in the same turn. This guy might need a minor rework is what I'm saying. Also creature type should be changed unless it's being used for something special. Nature Cells: This card is just, not fun. You barely have anything in this set to work with it because you have all these strange creature types, and when it DOES work it probably brings out one of the overpowered cards in this set. I suggest, really, that this card be removed. Plant Iramasha: Creature typessss. Also, her saproling ability should cost GG or 1G. Rapido Avaces: This card needs to be changed. It says sorceries and creature cards may be played as though they had flash, and to draw a card each time you play a forest or plains... except that this card itself is a sorcery, making these effects useless. It would work if the card was an enchantment but then the abilities would simply be too powerful. 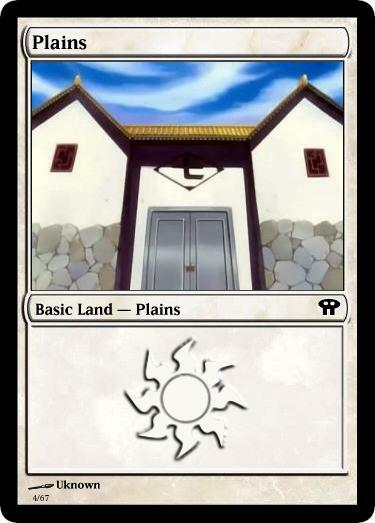 I also don't understand the background of the card either... it's just one big confusing mess. Resident of Karakura Forest: "Spend only green mana on this ability." Shrine of the Wild: The indestructible ability of this card need to cost one more. Survivor of the Forest: Uncommon, not common. 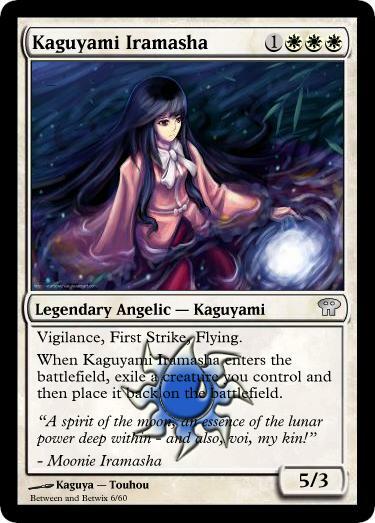 Unaligned Kitsune: "creatures you control gain vigilance until end of turn." Vanguard Envoy: Farhaven Elf. This card is super broken dude. Washi Family Time: Overrun. So green got some really powerful cards this set, didn't they? Werebeast Maiden: Elvish Champion. I can do this all day. 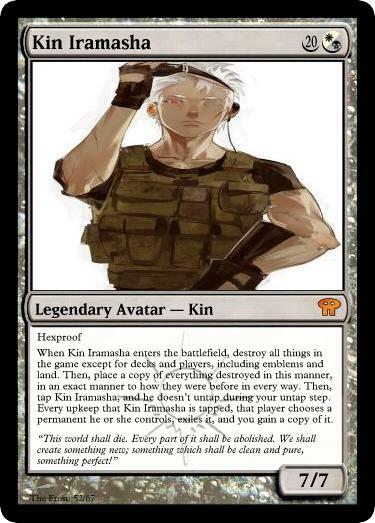 Akisame Hoshi*: Type needs to be "Legendary Creature", and Akisame is not a creature type. Also, this guy needs a minor rework... he'll get his ability off twice and then get exiled. There is no way of gaining life counters back and so there's no point in having the number 13 or 6 in there unless reworked. Snake Seal: Except nothing has a Phyrexian symbol. 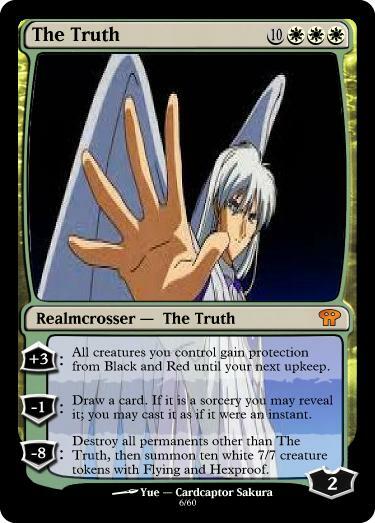 Yako Grim: Reaper in the creature type doesn't have a use and even if it did it would be put after Human. Additionally, this guy is sorely underpowered, has a clunky ability, and has green splash in there over blue for no reason. 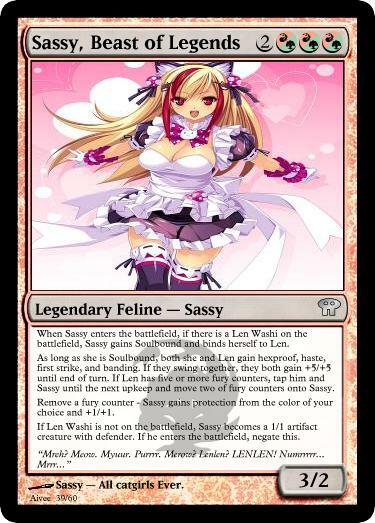 Sassy, Beast of Legends*: As I go down this list I find it harder and harder to point out all the things wrong with a card like this... I'll just say it needs a rework. Nature Raised One: Has no power or toughness. WIP: TOO MANY CARDS WITH ISSUES.